Bandung District Court judges have reinstated sacked PT Micro Workers and ordered that their salaries be paid. “We warmly welcome the decision of the Industrial Court judges (PHI) Bandung District Court, after a panel of judges chaired by Mahmoud MH and Judge DR.Syahrul member Eko Wahyudi (adho) and Haris Manalu (adhoc) won the PT Micro Garment Workers and employers require or PT Micro Garment owners to fulfill the rights of workers,” said Ikin Rahmat on Facebook. After a trial that lasted one hour and 45 minutes, the judges ruled that the laid off workers should be re-hired and their salaries paid from May 2011 to November 2011 as well as allowances. 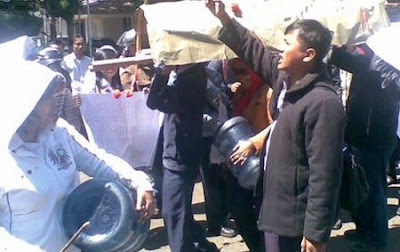 “Hundreds of workers, mostly women shouting slogans, could not stop crying over the decision of the judges to win the workers who deliberately stay in the Court of Industrial Relations District Court in Jalan Soekarno Hatta Bandung Bandung,” reported Ikin Rahmat. “Even though most of the workers are escorted by students and other labor activists immediately perform prostration of gratitude on page PHI Bandung office,” he said.